We are known for our wide assortment of Transparent Holograms, which are developed basically for ID cards to offer protection against fake ones. This range is largely appreciated for its superior quality and effectiveness. 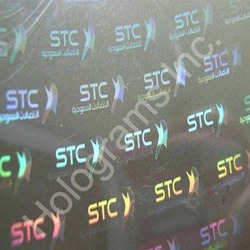 Our such range of Transparent Holograms is fabricated in compliance with the industry set norms. 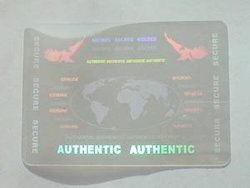 Holographic ID Overlays are made for ID Cards protection against fake ID cards and cheap Identifications. Transparent holograms and Laminates are indeed transparent and do not abstract the image on ID cards and you can see its Hologram image. 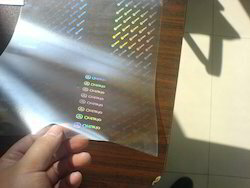 Instead of the Normal Laminates on the ID cards and Documents, Our Holographic Transparent Overlays can be used.They not only add security but also make the document/Card attractive. We can also develop Customized Transparent Holographic solutions on PVC, BOPP, Polyester, Etc., As per the clients requirement. We manufacture and offer highly secure Holographic Pouches. These pouches are manufactured using quality materials and are guaranteed to provide a high degree of security and integrity. These can be obtained in custom or standard specifications. Our prices are reasonable and our shipping is prompt. Looking for Transparent Holograms ?